Erno Rubik, known worldwide as the creator of the Rubik’s Cube, born July 13, 1944 in Budapest (Hungary), during the World War II. Son of a man of science (aerospace engineer) and a woman of letters (poet), Erno Rubik receives influences by both parents that can be seen during the rest of his life. Despite he starts sculpture studies, in 1967 is graduated by the Faculty of Architecture of the Technical College of Budapest, doing postgraduate studies in sculpting and interior architecture. Early in the decade of the 70’s he works as an architect, later to become professor of Interior design at the School of Applied Arts. Erno is passionate about architecture, which he describes as one of the most complex activities as it combines the features more characteristics of science, technology and art. In his work as a teacher, is convinced that education is the best way to discover and learn, through the constant search for new methods of teaching. And from that quest is how the Cube born. It is during the spring of 1974 when he has the idea of ​​building a cube of interchangeable pieces. Although he initially thinks to build a 2×2 cube, finally he chooses to construct a 3×3 cube because in this cube the centers remain fixed. He tests different designs, including a failed design with elastic bands to hold the pieces together. In the final prototype pieces stay together because they fit with each other. In this way, he solves the problem of structural design which involved the cube for him, unable to imagine its future popularity as a toy. 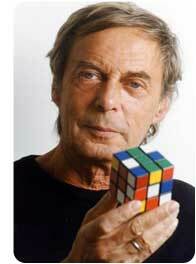 With the pleasant feeling of having built something original, something new, Erno Rubik starts to try to solve it. It is not easy. He even doubts if there is a method to solve the puzzle. He thinks he can rotate the faces randomly, but he realizes that the chances are nil. Finally, after more than a month studying the cube, he solves it. On January 30, 1975 Erno requests a patent for the Rubik’s Cube, originally called the Magic Cube (Buvuos Kocka in Hungarian). The patent is granted in 1977, while the Cube is started to be sold at the end of that year. Quickly becomes very popular in Hungary, and three years later achieved fame throughout the world. Rubik’s Cube fever had begun. The fame has caused that Erno Rubik is now a private person, not easily accessible and he does not usually appears at Rubik’s Cube events. However, he has continued to design games and puzzles with his own company Rubik Studio, as the Rubik’s Magic, Rubik’s Master Magic, Rubik’s Snake or Rubik’s 360. He also continues teaching at the university and has created the International Rubik Foundation to help talented young engineers and industrial designers.